The King (of the dunghill) is dead. When I went out to let the hens down this morning, there was a pile of feathers under the ark. All the hens were present but no Hobbes. I assume a fox must have got him as he went to bed last night. Reynard must have fancied a change to rabbit. 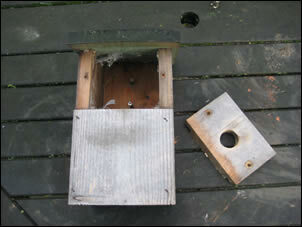 One of my jobs over the weekend was to check and clean our three bird nest boxes. We've had one of them up a few years now, and the others only a year or two. Although there's plenty of hedgerow and woodland in the area it's nice to provide a place for them to nest, and gives us a great opportunity to observe them every day. It has been the most lovely day here - cold, light wind and sunny. Perfect for pottering in the garden. Or for killing chickens. Yesterday, Dan and I had our annual trip to Glasgow. Before we had pets and livestock, we used to go to Glasgow regularly - bit of shopping, cinema, dinner, stay over, leisurely breakfast. Friday was our wedding anniversary, so we decided to have a day shoppping, lunch, cinema - by 3pm, I just wanted to come home. Anyway, the consequence of that (apart from my sore feet), is that we had lots to do today - but it was a perfect day for doing it! Read more on Lazy Sunday? Welcome to any readers of "Country Living" magazine! We get a mention in the January 2008 edition of the magazine, in "the good life" section. I subscribe, so when the magazine came in last week, I was browsing through it and noticed, to my great surprise, that the website features in it. So if you've found us from there, hello and welcome and we hope you'll stick around. Back in September we killed a cockerel for the table for the first time. It wasn't exactly textbook (at least not according to Seymour) but we got there in the end. This morning we were up early again to despatch another. We had been planning to kill all three of the surplus cockerels we had, but with the loss of Hobbes a few weeks ago and a friend wanting a cockerel to give as a Christmas present we were left with only one to spare. No, not a native of Sweden! But the root vegetable. I've posted before about how Felix only eats cat food. Cassius loves any kind of meat, prawns, fish, cheese, cream - Felix has been offered all these things, has sniffed tem, occasionally licked them but has never actually eaten them. Tonight, Dan and I had haggis, tatties and neeps. There was a very small amount left on the plate - we were astonished to see Felix eating the swede! Dan's real glad Felix sleeps on my side of the bed! A long time ago we tried making our own wine. It wasn't a total disaster, but while the resultant blackcurrant and pea-pod wines were alcoholic and just about palatable, they didn't seem to be worth the effort - a 3 quid bottle from Tesco was infinitely better than anything we could produce ourselves. Our wine kit was duly sold on eBay, and we've been happily drinking supermarket wine ever since. One thing we're talked about many times since then has been brewing our own beer. Never ones to be put off by previous failure we're now embarking on that particular journey - today I ordered a Premium Real Ale Starter Kit from Brew it Yourself. This morning I shot a little video tour of part the smallholding. As you'll see it was unscripted and I look like I've just woken up - too many early mornings! The Accidental Smallholder tour from The Accidental Smallholder on Vimeo. There was a temporary problem with the forum registration which has now been fixed. So if you tried to register and couldn't see the verification letters, please try again. Merry Christmas to all TAS readers and contributers form everyone here at Longcarse Farm Cottage! We hope you have a happy, safe and prosperous 2008, full of joy and love! Well, Christmas hasn't QUITE turned out as expected. Lorna, our daughter, went down with a heavy cold on Sunday, I succumbed on Christmas Day and now Dan has the lurgy. Fortunately, Lorna's now fine apart from a bit of a runny nose and I feel loads better tonight. I had planned to start preparing for the new year today and I had hoped to get Smokey out for a walk, but the weather has been miserable and we felt rough, so it was do the bare minimum and huddle round the fire to watch the horseracing. We don't currently run our smallholding as a business. However, in 2008, I want to put it on a more business-like footing, at least keeping a better track of income and expenditure. Last night, I decided to work out what the financial picture was for the pigs last year. We sold two half pigs and kept a whole pig for ourselves; I had a record of the purchase price of the weaners, the slaughterhouse and butchery charges; although I hadn't recorded all feed bought, I was able to make a fairly accurate calculation of the cost of feed. All in all, our whole pig cost us £120. We have to decide if that is OK - if not, then we need to have a think about making changes to the way we manage this "enterprise", especially with rising feed prices.